Rabbit Stew: Buying the HW80k: Grandchildren - and some advice. Buying the HW80k: Grandchildren - and some advice. I bought my gun from a friendly man who greeted me at his front door wearing camouflage gear and Wellington boots. He took me down to his immaculate cellar - full of shooting and fishing gear - where the polished and highly impressive looking gun was laid across a maintenance stand. He told me that he'd adapted the gun for use by his grandson; his grandson had used it for a little while but had recently gone to a game fair where he'd had a go with a pre-charged pneumatic and had - after the experience - become adamant that this would be the only kind of air rifle he'd be willing to have anything to do with. His grandfather shrugged at this and said, "Well, what can you do?" 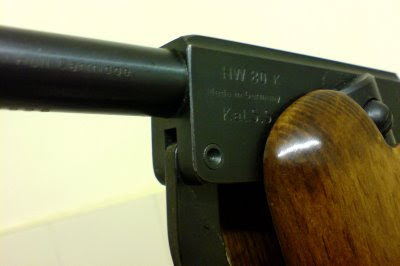 He did seem genuinely sad about his grandson's choice - and I could see why: the HW80k was a handsome gun and he seemed sad that his grandson didn't want to embrace the rifle as a kind of family heirloom. He showed me round his cellar, showed me the centre fire and rim fire bullets he had out on his work bench and we chatted about waders and fishing for Perch and Pike. Just before I left with the gun I asked him about lubrication. He said, "It doesn't need much. Every now and then, just put a drop - not more! - of 3-in-1 down the air hole of the gun into the spring chamber inside. That's all it needs; if you put more in, it ignites when you fire the gun - pistoning, it's called - and you end up in all sorts of trouble...". I went into a charity shop down the road from there and found - to my delight - two sturdy leather belts that were on sale for 50p each. I bought them both and, with them, I made a shoulder strap for the gun. I'm grateful to the man who sold me the rifle; I've since learned that lubricating the internal mechanism of a Weihrauch with 3-in-1 oil is not a good idea - but I've no doubt that he gave me the advice in complete good faith.